To visit Chanticleer is to step into a world of beauty and creativity that few other gardens can match. Each of its many areas—including formal borders, woodland glades, and a fantasy garden planted among ruins—offers a unique embodiment of colour, texture, and form. The sources of this distinctive blend of inspiration and practical craft are at the heart of The Art of Gardening. In these pages, you’ll learn techniques specific to different conditions and plant palettes; how to use hardscape materials in a fresh way; and how to achieve the perfect union between plant and site. And Rob Cardillo’s exquisite photographs of exciting combinations will be sure to stimulate your own creativity. Whether you’re already under Chanticleer’s spell or have yet to visit, The Art of Gardening will enable you to bring the special magic that pervades this most artful of gardens into your own home landscape. 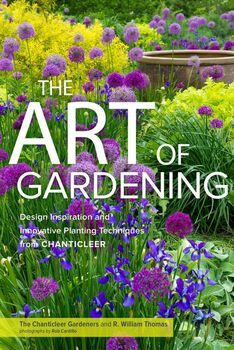 This visually stunning book shows gardeners how to incorporate the lessons of Chanticleer, one of the most imaginative public gardens in the United States, into their own landscapes.